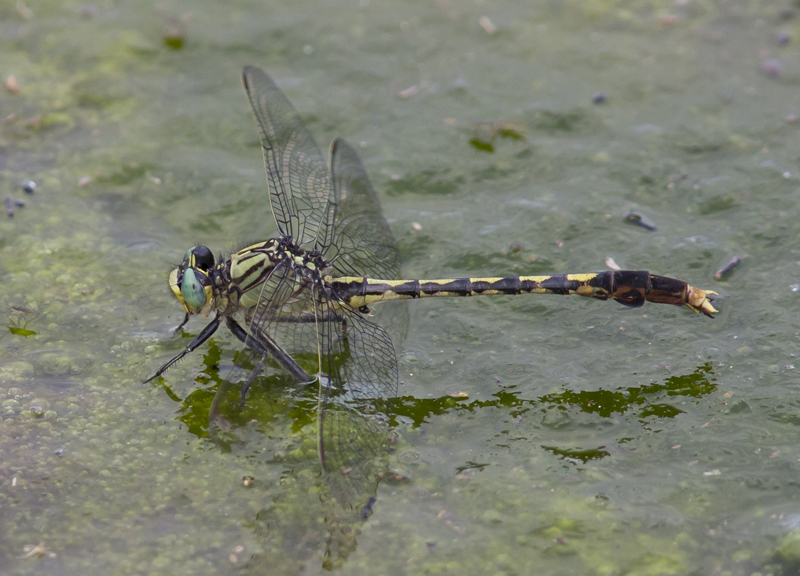 [View PDF] Unicorn Clubtail (Arigomphus villosipes) by John Petranka, Sally Gewalt. distribution The mountain region, the northern Piedmont, and the adjacent northern Coastal Plain. A record from Bladen County seems odd, and it is not in Cuyler's specimen collection. Additional records in the past few years have extended the range slightly southward, to Guilford, Alamance, Orange, and Durham counties. NC lies at the southeastern edge of the species' range. abundance Uncommon (and possibly local) in the mountains, but probably very rare to rare in the southwestern counties. Seemingly very rare eastward in the Piedmont near the VA border, to Rockingham County; rare to locally uncommon (but increasing) in the northeastern Piedmont, but currently no Piedmont records for the southern 70% of the province. In the Coastal Plain, apparently rare south to Washington County; however, there are no records since 1998, and thus its current status in that province is not known. flight The mountain flight occurs from late May to late July. The Piedmont flight is earlier -- early May to mid-June (and likely into July). Not surprisingly, the Coastal Plain flight is even earlier -- mid-April to mid-June. habitat Generally a lake and pond species, or slow streams; muddy bottom waters preferred. behavior Occurs around ponds and lakes, perching on the ground or on vegetation around the water's edge. It seems to favor small ponds in sunny locations, often in somewhat disturbed situations. comments Until 10-20 years ago, this species had an unusual range in the state, being found mainly in the mountains and the northern Coastal Plain, at least based on Duncan Cuyler's records. However, in the past few years there have been a modest number of records, mainly made by John Petranka, from the northeastern Piedmont, such that the former large gap between the mountains and Coastal Plain has now been mostly filled in. Unless data are uncovered soon for the Bladen County "record", we will likely remove it from the database; this county lies far to the south of any other known records. Comment: Guilford, 2018-06-06, retention pond at SR 2832 @ I 785/840 Photo by: John Petranka, Sally Gewalt. Comment: Guilford, 2018-05-23, Northeast Park. Pond alongside west side of loop road. - Males. Comment: Madison, 2015-06-05, Pond at junction of alternate 23 and Laurel Valley Road. - New record for Madison Co. Comment: Alamance, 2015-05-13, Cedarock Park. Pond near the picnic shelter; seen around the footbridge at end away from the dam. - Males. Comment: Durham, 2015-05-09, Horton Grove Preserve; Sowell Trail Pond - Males. Perched on vegetation and on floating leaf near shore. First record for Durham County.